Gorgeous golden hair band with pompoms. Dress to impress !!! Hair band with flowers from Maileg. Must have for flamingo and princess girls . With this flamingo bag from Jellycat you can take your favorite stuff with you. Beautiful French cat !!! 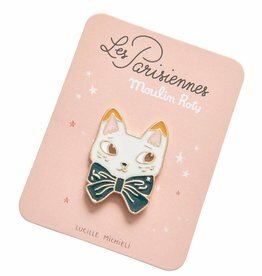 pin broche from Moulin Roty. Designed by illustrator Lucille Michieli.